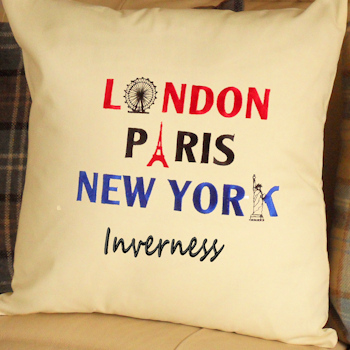 Put your town on the map with this personalised famous cities cushion beautifully embroidered with London Paris New York landmarks, you add your town along the bottom! Approx 41cm or 16 inch square 100% cotton cushion cover in your choice of colour. Inner cushion fill is included. Enter the name of your village, town or city to personalise this cushion as a special keepsake gift! This custom embroidered cushion is a wonderful keepsake gift to commemorate a wedding, anniversary, birthday, housewarming gift or holiday!